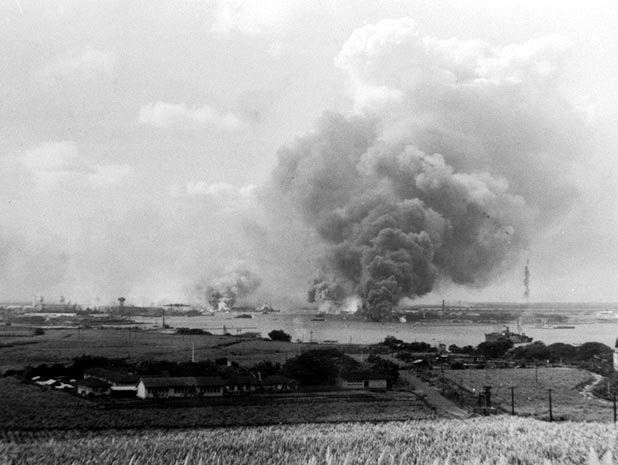 Ford Island, Pearl Harbor following the December 7th attack. Born in Germany right after the Great War, Chuck Baggarley’s father served as a soldier in the American Expeditionary Force. He met Chuck’s mother while on occupation duty in the months following the Armistice. The family moved back to the United States in the early 1920s, where they ultimately settled down on a Washington wheat ranch. Like so many of his generation, Chuck fell in love with the romance of flight as a young boy. While working on the family farm, he’d occasionally catch sight of the biplane that delivered mail in the area. He later made friends with one of the pilots, whom the kids just called Casey, and resolved to get into the air himself one day. Even Case’s subsequent death in a plane crash failed to curb Chuck’s enthusiasm for flying. After high school, he joined the Navy in February of 1940. After training, he joined Patrol Squadron 22 (VP-22) in October of that year. 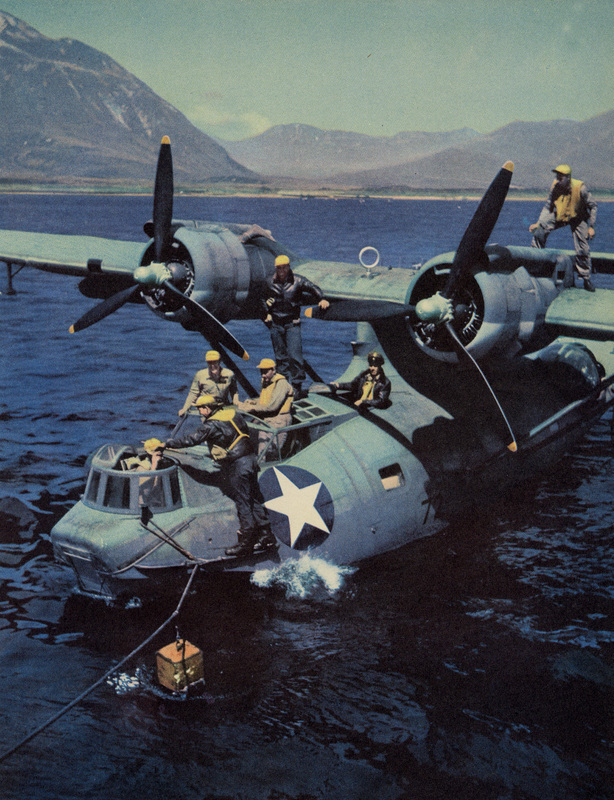 Flying PBY Catalinas, long-range maritime reconnaissance was VP-22’s primary function. At first, the squadron assigned him to ground duties, but he eventually found his way onto a flight crew where he really wanted to be. A year later, Chuck endured the Pearl Harbor attack, then later went with VP-22 to the Dutch East Indies, where the squadron joined PatWing 10. The start of the Pacific War found Patrol Wing 10’s squadrons scattered throughout the Philippines. 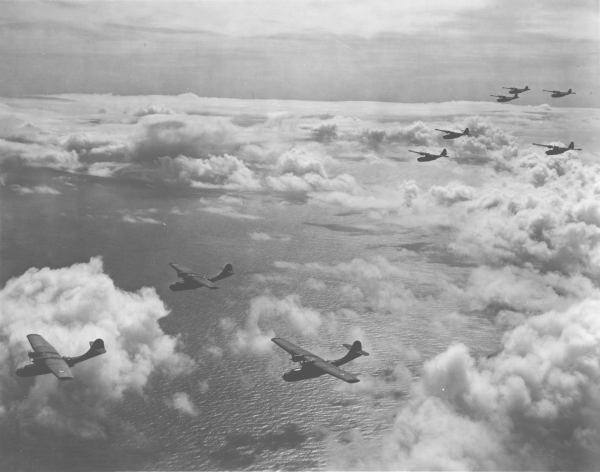 After brutal losses, the wing’s surviving PBY’s withdrew south to take part in the defense of the Dutch East Indies. During that desperate struggle to slow the Japanese juggernaut, PatWing 10’s pilots and crews endured repeated air attacks while hopping from base to base to keep from getting overrun. USN crew works on a PBY’s waist blister. I went out to Pearl Harbor in October of 1940 to join VP-22. I rode a big troop transport to the islands, and I remember being seasick almost the entire time. Later, I discovered that I sometimes got airsick when I started flying with the squadron. I had gone to aviation ordnance school in San Diego only a few weeks before, so when we reached Pearl Harbor, I was assigned to the ordnance shack. I made slicks for bombing practice for awhile, but I used to watch our PBY’s as they were being launched and I knew that’s what I wanted to do. I made it known I wanted to get onto a flight crew, so they finally took me out of the shack and put me on a beaching crew. At the time, the squadron was flying the PBY-3. These were Catalina flying boats with no landing gear as the -5A models later had. The pilots would land in the water and taxi across the water towards the seaplane ramp at Ford Island. When they got in close, the beaching crew would go out and attach wheels to the side of the hull so they could get up onto the ramp. I wanted to get on a flight crew as one of the mechanics. I later took and passed the third class exam and was put on a crew. I was a 2nd Mech at first. 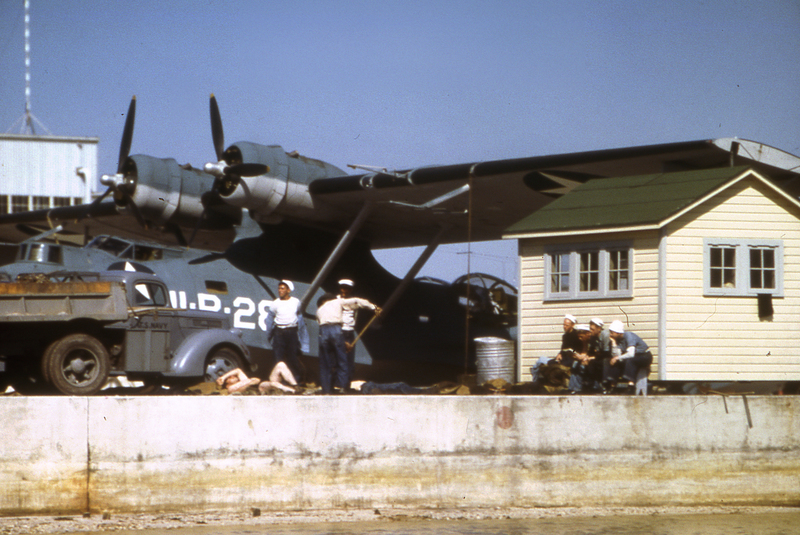 Each PBY carried twelve men, including two mechanics and three pilots. During our long patrols, we’d switch off responsibilities to keep everyone as fresh as possible. The mechs were basically flight engineers. We sat up in a little compartment where the fuselage joins the wing. In there, we monitored the engines and could control the fuel mixture, among other things. When not up there, we’d man one of the waist guns. 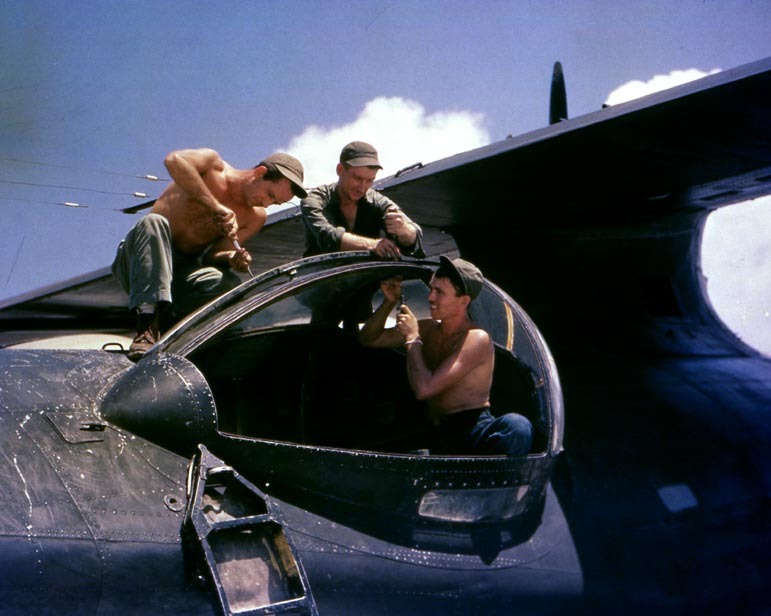 Our PBY-3’s didn’t have those glass blisters the later -5’s did, just an opening for the guns. We didn’t even have permanent mounts for the .50 caliber machine guns. They were very difficult to unstow and get into action as a result. The -5 fixed all that, though. Consolidated designed the PBY for long range patrols. Inside the hull, we had a sleeping birth with canvas cots. We also had a toilet and a small kitchen. We could stay up for hours, cruising at about 90 knots. Our primary duty was flying patrols around Pearl Harbor. But we also practiced bombing from 10,000 feet. We’d spend three or four hours dropping water filled bombs with our Norden sight, then fly home. One time, we even dropped torpedoes. We laid a smoke-screen once as well. Mainly, though, we patrolled out of Pearl Harbor from our base at Ford Island. 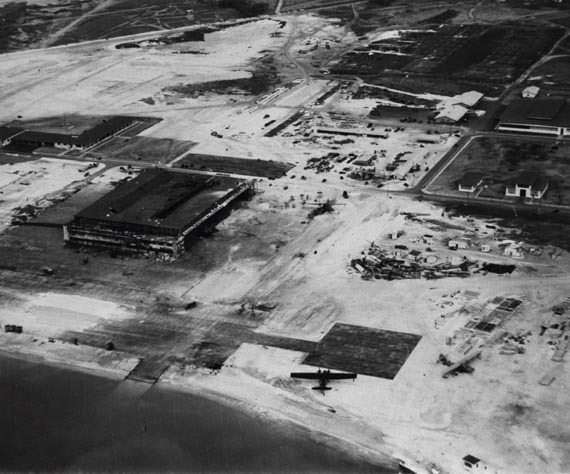 fact, we flew to Midway in October of 1941 and operated from there until Friday, December 5th. In early December, we started carrying live bombs under the wings of our PBYs. We found out that Admiral Halsey had gone out with the Enterprise to deliver some planes to Wake Island and had put us all on a war footing. We flew back to Pearl on December 5th. We were all ready for liberty after having been out on Midway for so long. On Saturday, I went looking for a friend named Marie-she was a waitress in Honolulu. I shot the breeze with her for quite awhile that night, then went looking for a place to spend the night ashore. No luck. I actually thought about sleeping at the Locker Club that night, but changed my mind and went back to Ford Island. I didn’t get into the barracks until about 3:00 that morning. I had intended to sleep in. At 0755, I awoke to the sound of machine gun fire and airplane engines. At first, we thought the Navy had laid on another drill. I looked out the window and saw planes zooming down the runway at Luke Field, near our barracks. The planes had little red dots on their wings and at first we couldn’t believe what we saw. These were Japanese! That’s when we knew this wasn’t a drill. I got dressed with the other guys and briefly went up onto the roof. I could see planes making torpedo runs on battleship row. Some came in so low they were below the level of the barracks. I thought I’d better go find out what to do, so I headed down the stairs for the front entrance. On the way, an explosion rocked the building and blew some of the windows out. When I got to the first floor, broken glass littered the floor. The windows in the front doors had been shattered, but this appeared to be a gathering point. Sailors and men were milling around, and I heard some of them talking about the torpedo attacks going on against our battleships. A couple minutes later, I saw one of our chiefs. As he passed by me, I asked him, “Hey Johnny, what are we supposed to do?” He shouted back, “Get down to the hangar!” It was three blocks towards the south end of Ford Island and away from battleship row. As I ran down towards our planes, I couldn’t see the attack on our ships, but I could see planes still swarming around right on the deck. Others were higher overhead, in perfect formation despite the anti-aircraft shell bursts exploding around them. We were fighting back at least. I stayed as close to the buildings as I could, watching out for strafing planes. After what happened in the barracks, I half expected a bomb to land right on me. 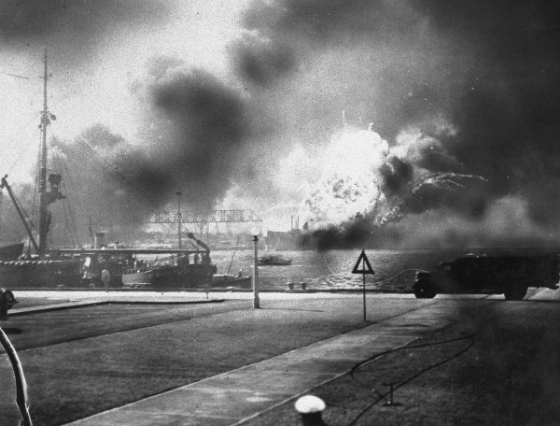 Battleship Row after the attack. The Oklahoma’s turned turtle. I reached the hangar after the worst of the first attack was over. Our ramp was a scene of utter destruction. The Japanese bombed our hangar right at the beginning of the attack. One bomb exploded inside, setting one of our PBY’s on fire. Two of our men were inside the hangar at the time, but somehow they escaped injury. Another bomb hit right in the middle of the ramp, making a big crater. All around, our planes were just a mess. My plane, #10, had taken a direct hit before I arrived. When I got there, only the wing floats and tips were left of her. We started clearing the burning planes off the ramp as best we could. Wreckage was everywhere blocking our one remaining plane which had not been damaged. Other men climbed pulled the guns out of our destroyed planes and started setting them up all around the hangar and the ramp. Flames and smoke from Battleship Row could be seen for miles. 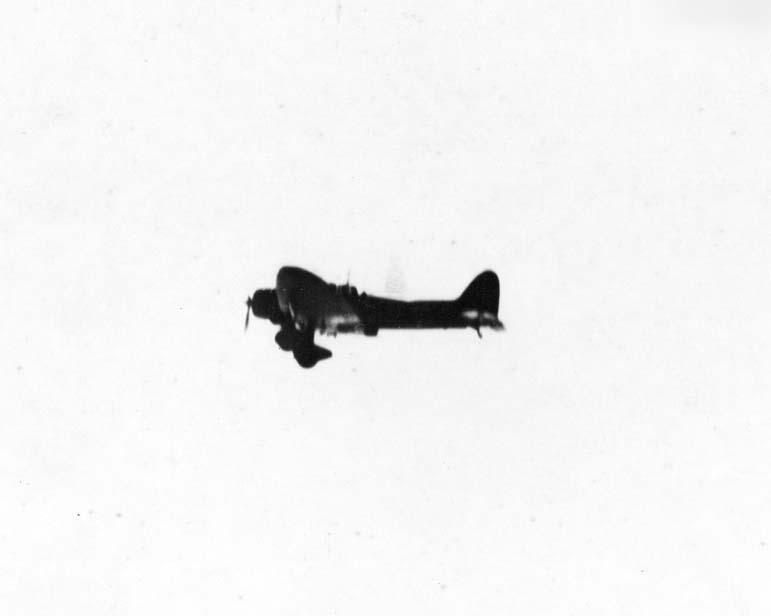 A Japanese Aichi D3A “Val” dive bomber hit during the attack on Pearl Harbor. We ran to across the ramp to it and found it was in bad shape. 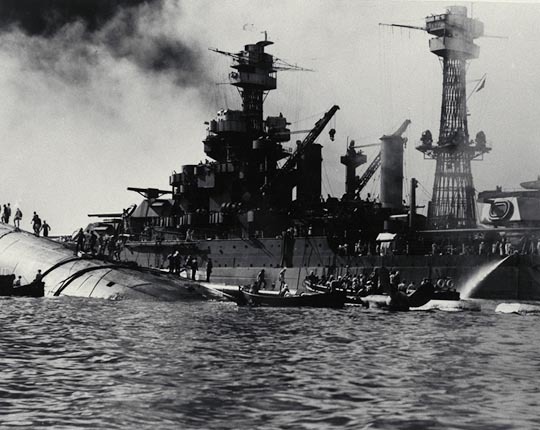 The hull was sprung and wrinkled by a near miss, and the .50 caliber guns in the waist were in the bilges. The sailor I was with took the bow gun and quickly got it working, but I had a hard time with the .50s. Finally, I managed to get one unstowed and ready for action, but I discovered I couldn’t shoot at anything. The fuselage was canted at such an angle that I couldn’t bring the gun to bear on any of the planes passing overhead. Guns in the other wrecked PBY’s were blazing away, as was the guy in the bow position in #13, but I couldn’t shoot. About this time, the USS Shaw exploded in a floating dry dock across the harbor at the Navy Yard. It was a spectacular explosion, and I felt the blast even inside #13. The USS Shaw explodes in dry dock. 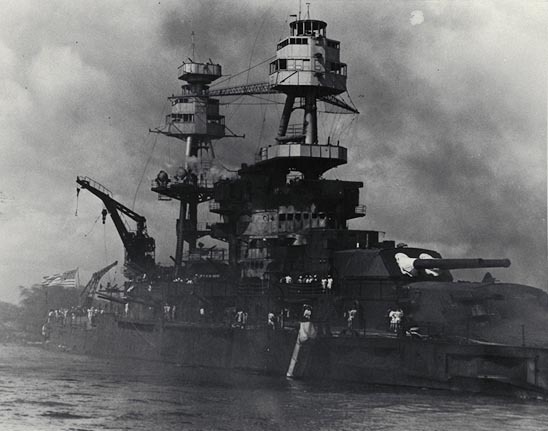 Then the USS Nevada tried to get out of the harbor. She started running down the channel, every anti-aircraft gun aboard firing at the enemy planes she attracted. Dive bombers hit her repeatedly, then pulled out right over our ramp. Our guys were firing away with everything they had as well. As Nevada passed by us, and boy was she an impressive sight. I could see bombs splashing all around her, kicking up tremendous plumes of waters. Through it all, the Stars and Stripes flew from her fantail. On Sundays, the ships flew a much larger American flag than the one used during the rest of the week. As she steamed past, I could see her huge flag fluttering proudly in the breeze despite all the carnage around her. Those of us watching her so wanted to see that ship and its gallant crew survive-and win. As I think back over that scene, the Nevada fighting for her life as every gun in the harbor tried to help her out and knock the dive bombers down, I think I can relate to what Francis Scott Key must have felt during the bombardment of Ft. McHenry. I understand the inspiration behind the Star Spangled Banner, and when I think about those words “whose broad stripes and bright stars….” well, it always evokes an emotional response in me. Every time I hear our National Anthem, or witness the presentation of the colors, I think about the Nevada and her brave crew. Home of the brave? You bet. I saw the bravest that day. The Nevada aground after her legendary run through the harbor. The Japanese failed to sink her in the channel. That would have been a disaster for us if that had happened. Instead, the Nevada’s crew beached her across from us at Hospital Point. The second attack ended, and we set about clearing more wreckage and fighting the fires around our ramp. Meanwhile some of the men from our squadron who’d spent the night in town showed up with all sorts of stories. Some of them were strafed trying to get back to the base in their cars. 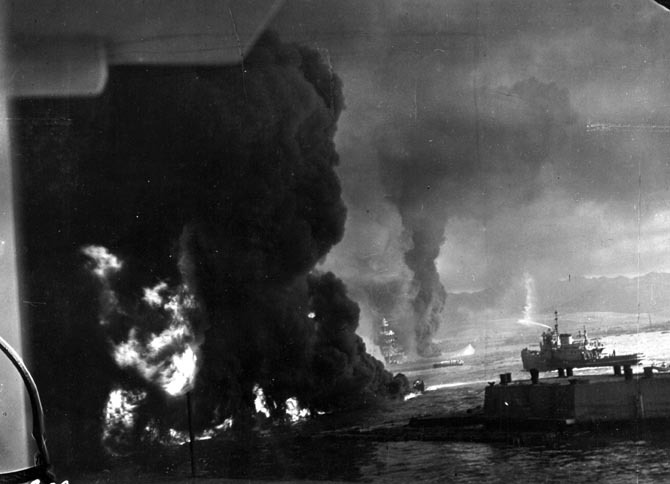 Others talked about sailors forced to swim through wide swaths of burning oil on the surface of the harbor in an effort to escape from their sinking ships. We continued to work, but no words can possibly express how we felt, especially after hearing those stories. More guns were stationed around the ramp while a civilian bulldozer showed up to help push the wreckage out of the way. We had one PBY left out of 13 in the squadron. The other patrol squadrons were in similar straits. By bombing our PBYs, the Japanese had destroyed our ability to find their carriers. Later that afternoon, we ate our first meal of the day. Somebody brought sandwiches down to us, along with a cup of water each. The water came from our swimming pool, as when the California settled to the bottom, she severed the water pipeline to Ford Island. When we returned to our barracks, we found it crowded with wounded sailors and the families who lived on Ford Island. The wounded men came from Battleship Row. It was an indescribable scene. Later, after dinner, we went back to the hangar where some officers called us together. They told us that there were still a few JRS amphibians still flyable and that they were going to be sent out to find the Japanese fleet in the morning. They needed gunners to help man these planes and asked for volunteers. After what we’d seen, there was no shortage-about 20 of us volunteered. The JRS was a twin-engined amphibian that normally didn’t carry any guns. We assumed that during the night, they’d mount .30 cals on them. Why else would they need experienced gunners? They woke us before daylight the next morning. The local gunners had the jitters and would occasionally open fire on a start. Earlier in the night, some planes from the Enterprise came into the harbor and just about every gun opened up on them. Several were lost. We received our plane assignments, and then they handed each of us an old bolt action Springfield .303 rifle and two bandoliers of ammo. Nobody had put machine guns on our planes. The rifles were the sum total of our defensive strength. Thus armed, we took off after a Japanese fleet that had inflicted so much damage to our own. It never crossed our minds that this was a suicide mission, but I do remember thinking that I hoped we didn’t have to use the guns we had. When you’re that age, you just don’t think about consequences. We considered ourselves immortal. We flew twice that day and never saw a thing. If we had, I wouldn’t be here today.